I didn't mean to take such a prolonged break from my internet ramblings--life got in the way with a promotion at work (woop woop) and a trip out to the Midwest last week that left me a little drained. I'm sure adding on a boozy weekend with my best gal pals from law school didn't help, but it was so worth it. I did a spur of the moment chopping of the hair--it was so damaged and needed to be done. I was attempting to channel this pic, but I think my stylist was overzealous with both length and layers. Le sigh. It will grow. Sushi Fridays have become a tradition around these parts, and I love it. 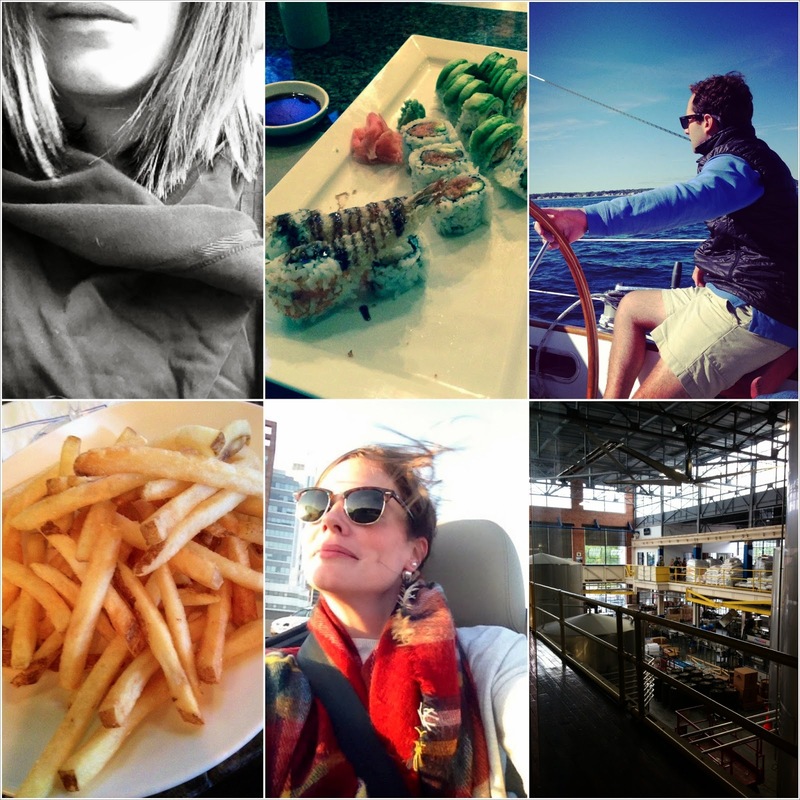 I had my Maine weekend with MET*, and there was sailing and lobster and shopping and it was perfect. This past weekend was a law school reunion with my BFFs in CT, and one lady lawyer has a red VW Bug convertible which makes for the best selfies (according to me and my sweet windblown hair). During my lady lawyer reunion, we hit up Two Roads Brewing Company and take it from me: their Hefeweizen and Pumpkin Ale are mighty tasty (hence, the aforementioned selfies). So that's what I've been up to--I'm glad fall is upon us and I can start cooking up my favorite comforting recipes. I'm of the position that the cooler temps permit a little extra girth around your middle for warmth and safety. At least that's what I tell myself. *In the event inquiring minds want to know, MET is my manfriend. We went to high school together and reconnected at the beginning of the summer. He is super cute and nautical and I like him a lot. Congrats on the promotion! That is awesome. I love everything about this post. Congrats on the promotion - life is good! Yay for you on so many levels!